Look at all the variety of Hokkaido Chiffon Cupcakes posted on the last Bake-Along. This cake is so popular for its super soft and fluffy texture. Really! Tell me who will ever turn away such a pretty and delicious cake. I had made a few round of Hokkaido Chiffon Cake during my last few gatherings with friends. I love the Strawberry flavour (which you can find it here) so much until I have tried making the banana flavour one. What made me decided to make the banana flavour of Hokkaido Chiffon Cupcake was the Tokyo Banana. My 2 boys love Tokyo Banana so much. I love it too, but I find the banana filling is overly too sweet for me. 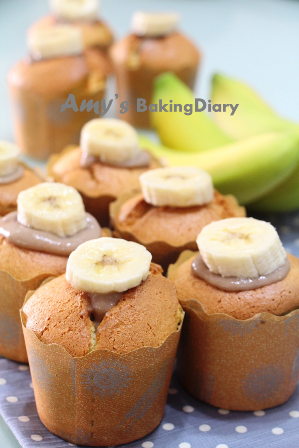 Therefore, I tried making my own banana filling and took reference from Zoe’s Hokkaido Banana Cupcakes and it turned out to be so good and it tastes almost exactly like Tokyo Banana!! This is indeed an all-time favourite and fabulous recipe! Sieve flour and baking powder together, set aside. Separate egg yolks and whites and bring to room temperature. Place egg yolks in a mixing bowl, add in sugar, in 3 separate additions and with a manual whisk, whisk till the mixture becomes sticky and turn pale. Drizzle in the oil, whisking at the same time till the mixture is well combine. 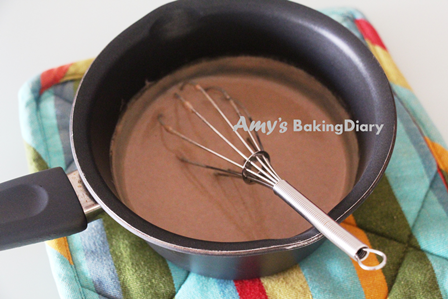 Sieve over the flour mixture and whisk until flour mixture is fully incorporated into the batter. In a clean, dry mixing bowl, beat egg whites with an electric mixer until mixture becomes frothy and foamy. Gradually beat in the sugar and beat on high speed until just before stiff peaks. Add the beaten egg white into the egg yolk batter in 3 separate additions, each time folding gently with a spatula until just blended. 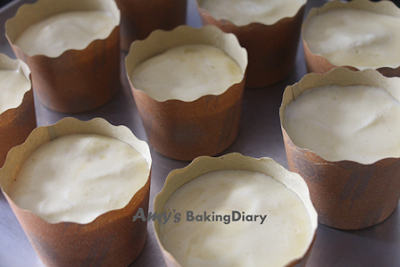 Spoon the batter into the paper cup and bake it in a pre-heated oven of 170˚C for 40-45mins or until the cake surface turns golden brown. Mash and blend the banana in the blender machine. Cook the mixture with low heat and constant stirring until it is thicken. Do not over-cook your mixture. 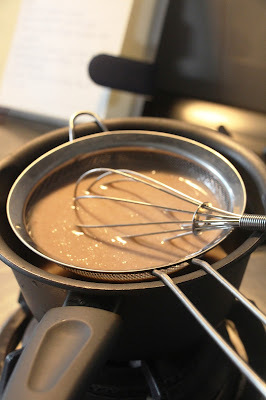 Remove the mixture from the heat and continue to stir until it is cooled. Chill in the fridge for about an hour. Transfer the mixture into the piping bag with the long narrow piping tip attached. 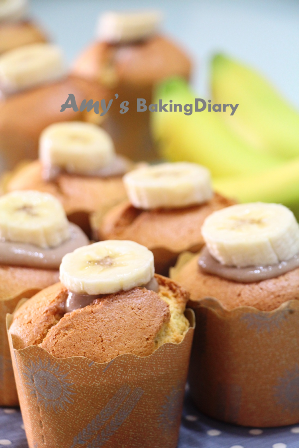 Pipe the cream into the cake and top with a slice of banana. Dust the cake with icing sugar (Oh no! I forgot again but it’s optional lah :P) and serve. These are such pretty to see and nice to eat HCC. I would love to have this with a cup of warm tea. Glad that you shared this to LTU! I've also bookmarked this Banana HCC to try some other days. Yours looked fabulous too. BTW, have you linked your post to LTU? Karen, I haven't as I need another computer to do the linkage as my company laptop is unable to see the linkage due to security reason. hi amy! 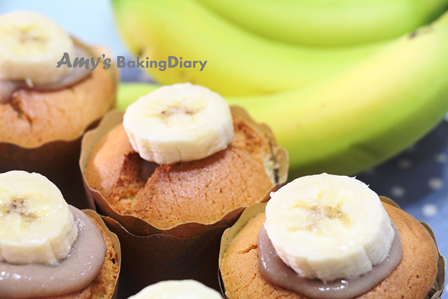 looks like one day i shall try making one with banana flavour too! These Banana Hokkaido Chiffon Cupcakes looked really good...the strawberry ones too..yummy!!! I can never turn away, yum yum! Hi Amy, your cupcakes look lovely. I like.